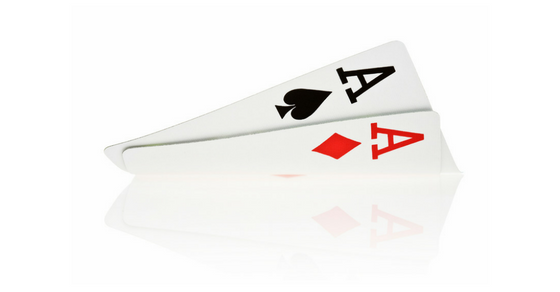 One of the hardest things for new and experienced players alike to do in poker is to fold an overpair. After all, you wait so long to finally get dealt your aces or kings. Nobody likes to fold them. But of course sometimes this is the right thing to do. I am sure that you can remember many times where you stuck around only to see your opponent flip over trips or two pair. It probably seemed fairly obvious after the fact didn't it? But for some reason you just couldn't find the fold button. In this article I am going to discuss the top 3 situations where it is correct to fold an overpair in poker and how to discipline yourself to make the right decision. The first (and in some ways the easiest spot) where you should consider folding your overpair is on the turn when your double barrel gets raised. A double barrel is when you raise preflop, bet the flop and then bet the turn as well. One of the key things to remember about most players at the lower stakes is that they are passive. If you use a HUD such as Pokertracker the AF (total aggression factor) will tell you this. Many players at the micros will have an AF of 1 or 2 which means that they are basically only making strong aggressive plays when they have a big hand. When somebody raises your double barrel this is a very strong aggressive play. The reason why is because it says that "I want to play for stacks." When somebody raises your double barrel they will typically have about half of their stack already in the middle. Therefore, it is pretty unlikely that they are going to fold their hand. Passive players just do not put this amount of their stack in the middle especially as the aggressor without a very strong hand. There might be a few maniacs and loose aggressive regs who are capable of raising the turn as a bluff or with a balanced range at the micros. But these players are extremely rare and it will be very obvious from their HUD stats. Against the overwhelming majority of players at the lower stakes (at least 95% of them), the correct play is to fold your overpair when your double barrel gets raised. If you continue, you will get shown a set, trips or two pair a huge amount of the time. Another situation where you need to consider folding your overpair is in multi-way pots. And at the lower stakes these are going to happen a lot. You can try using over-raises in some exceptionally crazy games but the bottom line is that sometimes you are going to be in a big family pot with your aces no matter what. It is important to understand that in a situation like this there is a significant chance that one of them will hit something strong after the flop. You may have had the best or the second best hand in poker before the flop but after the flop your hand is still only just one pair. Your opponents are going to be in their with all sorts of small pairs, middle pairs, suited connectors and suited aces. Therefore, the boards that you really want to be careful of the most are highly coordinated and wet with low or middle cards. On boards like this there are tons of flopped straights, two-pairs, pair + draw and sets that could already have you crushed or be a statistical favourite against you. You should still go ahead and make your CBet on these boards because you don't want to just give them a free card to hit their flush, straight or some silly two-pair. However, if somebody starts giving you big action by raising, then you should really consider backing down. It is important to keep the action in the hand in mind as well. Often a big clue that people miss is who somebody raises. Are they only raising you or are their several other people left to act as well? Ask yourself how likely it is that a passive player will raise the entire table with a weak hand in a situation like this. I think you already know the answer. Here is another multi-way pot situation that I recently discussed in a video where the turn card is terrible for our pocket queens. Make sure you are folding in these spots! The last set of clues that I look for when considering if I should fold my overpair are the history that I have with this person and any reads that I may have gathered in the past. If you encounter a player at the micros who is sophisticated enough to be able to bluff-raise or semi-bluff raise your double barrel for instance, they are much more likely to do it when there is significant history. When they don't know anything about you, then they have no way of knowing whether you will fold or not. But if they have a history of tight play versus you for example, then maybe they will think that they can get away with it. This is why if you read this blog a lot I actually suggest that you do the exact opposite. That is, make some crazy bluffs when there is no history at all because they will be less likely to suspect it. I think this should be a vital component of any Zoom poker strategy in particular due to the limited information in that format. The other thing that I am looking for is any history of making wild plays against anybody, not just me. While I don't really bother taking notes much when playing at the micros online because there are simply too many players, if I have some downtime and I see a reg show up with a crazy hand I will sometimes make a note. Also, if you are playing live or on just a handful of tables online then you should always be making at least a mental note of what the other players are doing anyways. So to sum up, if there is very little history and I have never seen my opponent make any crazy out of character plays in the past, then I will be more willing to give them credit and possibly fold my overpair. How Do You Discipline Yourself to Make the Right Fold? So now for the million dollar question. Even knowing all of the above, how do you hit the fold button in the heat of the moment with your aces, kings, queens etc? Well I am sorry to be anti-climactic but there is no magic pill or math formula in order to make yourself do this. Much like keeping yourself off of tilt, the real key is experience and some good old fashioned self control. By experience I mean getting shown the trips, two pair or straight enough times that you are finally sick of it. If you want actual proof then you can simply run a bunch of filters in Pokertracker like I discuss in this post and go see the raw brutal evidence yourself. You can even pull up your graph for when you decide to continue on in the hand after your double barrel gets raised. I gotta warn you though, it won't be pretty! The second way that you will learn to find the fold button is by learning to take your time in important spots like this and recognize the scenario in front of you. The nit just raised your double barrel! You know that he hit his set. You can either pay him off like every other mediocre player out there or you can exercise some self control and logical decision making to make the right choice here. With enough experience it will become like second nature. You won't "have to see it." Because you "already know it." Just make the fold and move on. Hopefully this article helped you to understand a few of the scenarios where it correct to fold your overpair. It never really gets easy. Nobody likes folding an overpair. But once you learn to recognize the common spots you will hopefully learn to start finding the fold button a little bit more often. And if nothing else, the experience of getting shown the nuts again and again should help you learn how to exercise more self control eventually and make the right fold. I just want to quickly end by letting it be clear that there is no way that you are going to make the right fold every time. Nobody plays perfect poker. It is important not to beat yourself up about making the wrong decision sometimes. Sometimes you are just going to get stacked and that is ok. The purpose of this article was to help you move the chains just a little bit and start making some of the more obvious folds such as against the nit who raises you on the turn. Let me know in the comments below what the main situations are where you have a problem folding an overpair. Do you have any advice on how to get away from overpairs? *New Here? * If you are new here and enjoyed this article, then make sure to check out my "Start Here" Page for all of my best micro stakes strategy articles. Also, be sure to hop on my free newsletter below for my free ebook and tons more elite strategy advice for the micros. heh, It just happened to me tonight... I just sighed, noted my lack of discipline, and continued on with a winning night overall... great blog post. 3Bet pots are definitely different. I am not folding anywhere near as much as in a standard raised pot. Mini-raise typically means the same thing as a normal raise but not always. Depends on the player. great article ! the spot im wondering is what if you just get aces heads up in a board like 778 vs a good reg and he just flat the double barrel, i would probably tripple barrel and try to get value from other overpairs or top pair i think but then what if you get raised all in on the river and you already invested so much chips in, should you still be folding? Is it better to check call the river and lose some value here? This spot is a bit tricky because a "good reg" is not going to call your triple barrel here. They will realize that their TT/JJ/A8 is no good. So you aren't really losing value by checking here. If you do decide to bet though and get raised then it is the easiest fold in the world. It has nothing to do with pot odds or how much you are invested because they are never going to make this play without the nuts. great answer, im wondering now about an unknown player , if you don't have infos much would you try to get that value bet on the river or play it a bit safer? Do you ever check fold a big bet after checking the river if the board isn't drawy at all and check call if all the draws missed ? also i wanted to ask...we talking about a single 3x preflop raise and a call but....what if i 3 bet? will the pot be too big to fold the river? 4 bet would but i should play it the same way in a 3 bet hand? Against an unknown I am probably going for 3 streets of value most of the time. Everything changes in a 3Bet pot because the ranges are much narrower. If the opponent is still there after I bet the turn, then I put him directly on a very high pair. He also has half his stack in the middle so he isn't folding the river. Therefore, I am always shoving. I can't remember where I came across the said betting pattern but I can tell you for sure that it helped me take the right decision more than once)) To tell the truth, I personally seldom go past turn bet when I feel like there's something funny goin' round there especially when a tight player steps in. Ya I think you couldn't go wrong in folding a large majority of the time in these situations because most micro players are very unbalanced in these spots. By this I mean that their range is heavily skewed towards a big hand. I ve been running into really weird spots with overpairs. 1. I have AA and 4 bet big, Flop comes KKQ Rainbow. why would he ever raise big here with a K or QQ in a 4 bet pot. 2. I have AA and 1 player raises, 4 players call and i 3 bet really large. I have been running into alot of these spots lately and been finding the fold button because i dont want to pay off people who call to get lucky. My final question is. Am i overfolding in these spots? I think these are just rare situations where you happened to get one of the worst flops possible. Even still, it depends on the player type and the stacks. Thank you glad it helped!